I’m pretty old. I’m sure most people would agree with me on this. I am not, however, old enough to have played Choplifter, an ancient game for an ancient incarnation of the Apple in which your little helicopter flew from left to right and right to left again, picking up refugees and blowing up tanks whether left or right or centre. I think all that’s left of the people who are old enough to have played Choplifter1 are fossilised remnants scattered amongst sedimentary deposits on the seabed. 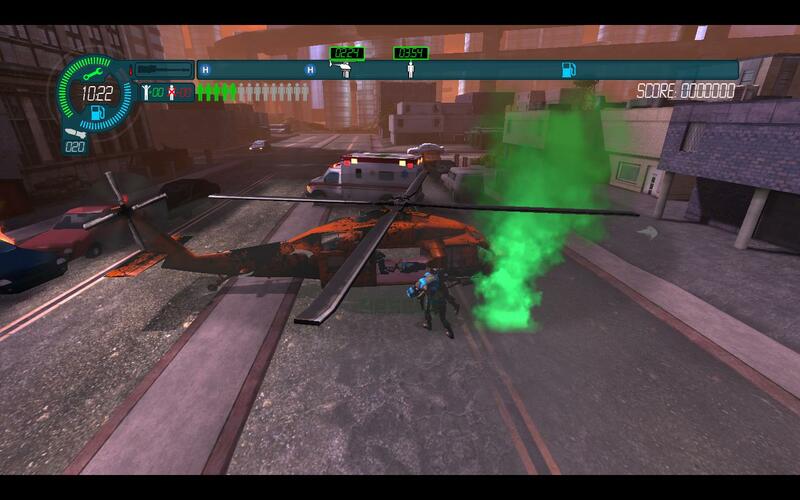 So it is a good thing that developers inXile have released Choplifter HD, a modern update with modern innovations such as pretty graphics, awful voice-acting, and zombies. Since I lack any truly antediluvian gaming history I’m going to have to go back to the merely Neolithic era of my touchstone Amiga days for a worthwhile comparison, since you don’t really get games like Choplifter any more. It’s defiantly retro in its approach; as I never played Choplifter I can’t really say whether it’s truly a 1:1 port of the gameplay, but what the HD remake reminds me most of is Amiga classic Walker, which was a similar side scrolling game where little men attacked your gargantuan war behemoth to be mown down in their thousands. What, you thought Choplifter was about lifting people to safety? Well, I suppose it is. Evacuating hostages and refugees and whatnot provides some much needed direction to the gameplay beyond progressing from left to right; you have somewhere to go – often multiple places you have to go – to pick people up, and there’s often a time limit involved before some greviously wounded medical case carks it that forces you to prioritise. You won’t always be able to fit everyone into the chopper in one go, either, which inevitably necessitates multiple trips. Between the refugees and the evacuation point stand all manner of nasty obstacles, ranging from tiny men with machine guns to rumbling tanks which can take out half your chopper’s health in one go if you’re not careful. The way the levels make use of the different enemy varieties is quite clever; if you fly low you make yourself vulnerable to RPGs and small arms fire. Flying high allows you to outrun bullets and rockets, but the developers expect you to do this and are very good at blocking the path they think you’ll take with a sudden curtain of AA fire. So it comes down to a tactical choice: either you fly high and hope your reactions are quick enough to dodge the AA before you run into it, or else you fly low and try to take out the RPG men before they can fire off their rockets. For what are ostensibly supposed to be rescue helicopters the choppers in Choplifter are astoundingly heavily armed with both cannon and an limited number of rockets. Firing is very simple most of the time; hold the right thumbstick in the direction you want to shoot and a red targeting laser will appear along with a box indicating which enemy you’re currently locked on to. Then you shoot them. 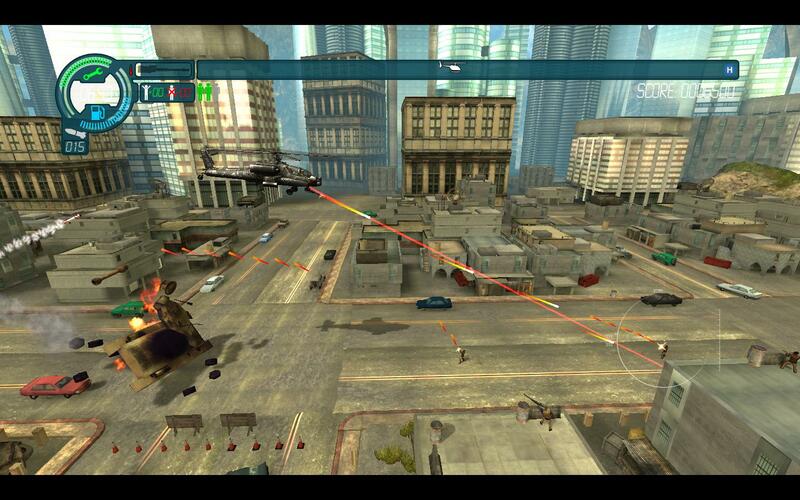 Matters are complicated by the existence of targets in the foreground that can’t be locked while the chopper is facing left or right – instead, you have to pivot the chopper so that it’s facing towards the screen to kill these enemies. Bizarrely you cannot ever target enemies in the background, which leads to the odd frustrating experience when there’s a tank leisurely rolling up a side street unloading shell after shell in your general direction and you can’t shoot back. There’s also some enemies and hazards that can’t be targeted but must simply be avoided. Seeing jets fly by in the background and hearing a missile lock tone is a sign that you should hit the deck immediately before they start an attack run which fills the entire top two-thirds of the screen with rockets. Mortars are far more tedious to avoid, being Choplifter’s version of the timed set of swinging blades/spike traps/crushing walls seen in RPGs and platformers the world over. Of all the enemies in the game it was the mortars which irritated me the most because the way they were placed and the way they’d been timed seemed deliberately designed to piss me off rather than to present an interesting obstacle. I found it incredibly hard to judge the timing of the shells and it was next to impossible to stop the chopper in time if I saw one coming down, so eventually I resorted to flying through mortar areas backwards which gave me the fine control necessary to make it through without losing half my health. In general if a game forces me to do something absurd to make it through a mission it’s a sign that mission is badly designed. 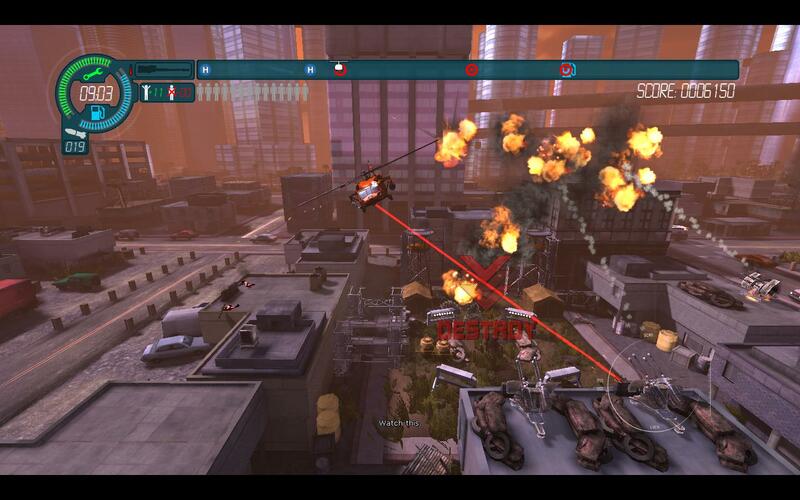 The mortars are the only significant level design blip I can actually think of, though. Choplifter’s missions are very hard in a refreshingly old-school way; that is, most of the time it’s a fun kind of hard and a challenging kind of hard rather than a brick wall kind of hard. The hardness starts to show its face very early on, too, with my first exploded chopper coming on mission three or four of the first campaign. Most of the levels that don’t have mortars in them excel in their ability to find this sweet spot between fun and frustration, and it’s honestly a shame that Choplifter HD ballsed up the metagame so badly that it actually inhibits replaying levels for a better score. You know the chopper capacity thing I mentioned earlier? When you start Choplifter HD for the first time all you’ll have access to is a crappy Little Bird scout helicopter that can carry 4-6 people at once. The multiple trips required to complete a level increase the time spent; increased time spent hurts your score to the point where you physically cannot get a five-star rating until you unlock a bigger chopper. However, unlocking bigger choppers is achieved by… collecting a certain total of stars from high scores. So once you’ve completed a mission for the first time, you don’t think “Wow, I missed out on five stars by a whisker! Time for another go!” but rather “That’s not actually possible without a chopper that won’t be unlocked for another five or six missions, I’ll come back later.” And then when you do, the upgraded chopper makes the earlier mission so trivial it turns it into a boring chore. It’s this which is Choplifter major design screwup. I might not like the mortars but I can live with them; the chopper unlocks on the other hand pretty much rob every single mission of any replayability it might have had after you’ve completed it for the first time. Without them, I feel Choplifter HD could have been a genuine minor classic. When I was playing the missions I could feel this palpable sense of potential that somehow never came to fruition; when I’d just finished a particularly fun mission I’d go to the menu and oh no the harder difficulty settings are all locked and so are the good choppers, and I’d end up moving on and forgetting about it. Locking off game content like this is absolutely crazy, but after the success of CoD there’s a perception that every game has to have unlocks these days to keep players playing and inXile have dutifully toed the line in that regard. By doing so, they’ve actually achieved the reverse; Choplifter HD is fun enough in an old-school arcadey sort of way, but it doesn’t have the longevity required to justify more than a couple of quid in a Steam sale. I certainly don’t regret the £7 I spent on it, but I’m a demented old man who wishes the Amiga age had never ended. For you, and for this game, £7 may be too much.